There’s high culture and there’s low culture and then there’s Disney World. I grew up going there and going there and going there; seriously, we went there a lot (we lived in Florida, so it was close). When I dream, I dream about theme parks (psychologists: what does that mean?) and the theme parks I dream about most often are Disney theme parks. So when Craig’s movie got into the Florida Film Festival in Orlando and he was hooked up with a hotel room and a car and all I would have to do is pay for a plane ticket there and back, it was hard to resist a trip to Disney World. It’d been almost ten years since I’d been there last and I was immensely curious to see if I’d still think if it was fun or if I’d outgrown it. More importantly, I wanted to write about the food–a strange idea, but a compelling one, perhaps. What’s there to say about the food at Disney World? Actually, there’s plenty. Think about it: Disney World caters to millions of Americans every year and those millions of Americans, at some point during their days of waiting on lines for Space Mountain and Splash Mountain and Thunder Mountain, get hungry. What kind of food will they find when the hunger sets in? Is the food they find today at Disney the same food they’d find 20 years go? And what does this food say about us as a country, as a people? Are we heading in a better direction? Judging by the food at Pecos Bill Cafe, Americans like meat. They want meat. They need meat. So the menu reads like this: pulled pork sandwich, bacon double cheeseburger, 1/4 lb cheeseburger, chicken wrap, chicken salad, taco salad, and a vegetarian burger. Really: it favors the meat eaters and so Craig and I, meat eaters both, got the meatiest options. Me: the pulled pork sandwich; Craig: the burger. Believe it or not–and I can hardly believe it as I type it–the pulled pork sandwich was actually pretty good. I tried not to think about the tortured pigs on the factory line that marched their way on to the bun and instead focused on the tangy, almost ketchupy sauce. Was it sophisticated? Hell no. Would it measure up in a BBQ contest? Definitely not. But at Disney World? It was fine fare. Craig’s burger on the hand was pretty cafeteria-esque. It came squished on the bun with nothing on it; you had to go to a toppings bar to top it yourself. Still, he was reasonably satisfied. And isn’t that the point? You don’t really go to the Magic Kingdom for an Epicurian experience. And I acknowledge it’s not really that revelatory to point out that Americans love their meat, their pork, their burgers and french fries. 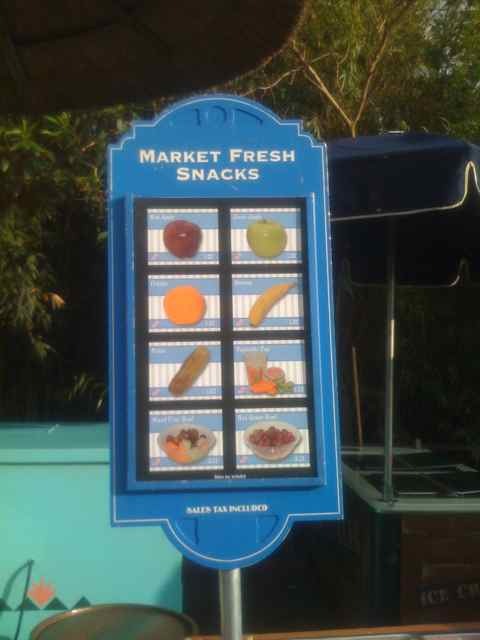 But does it inspire any hope to point out that there, outside the Jungle Cruise, I spotted this stand selling fresh fruit? This wouldn’t be there if there weren’t a demand for it, no? Perhaps enough customers complained that it was hard to get fresh fruit at the Magic Kingdom that they opened this little stand outside The Jungle Cruise? Should we score one for America here? Or is this a paltry, pathetic piece of evidence next to a mountain of meat and ketchup and grease? I’ll leave that up to you. As for dinner, I couldn’t really justify spending $30 or $40 a person for dinner in the castle or at the Crystal Palace Banquet Hall, so we chose the next best option: Corn Dogs! It was that or Smoked Turkey Legs and, actually, the Smoked Turkey Legs looked pretty good; but Corn Dogs were closer and we were hungry. They were cheap and, though I was dubious biting in, once I started chewing I smiled that smile only bad, theme park food can put on your face. Yes, I knew this would make me die one year earlier than I might have otherwise, but it was a hot dog dipped in corn batter and deep fried. How could I be angry about that? No, the Magic Kingdom isn’t trying to reform you or improve you or even nourish you. It just wants to make you happy and cater to the bratty child within you that wants everything fried and with a soda. You can’t fault it; this is the American way, and Disney is smart enough to understand our vices. Unfortunately, what’s a temporary vice for Craig and I on this day at the Magic Kingdom is, in fact, a regular diet for many Americans. If it weren’t, you wouldn’t find this food here: you’d find the food most Americans want. But this is the food most Americans want because it’s the food they eat, day in, day out. And that’s rather scary. I let The Magic Kingdom off the hook, but I have harsher words for Epcot. Here I am in Epcot and I have to say: it’s my favorite theme park of all theme parks. It’s a theme park for nerds. Don’t I look nerdy and happy? We had quite a time riding Spaceship Earth and Test Track and the new Mission:Space (I chickened out there too and chose the wimpier version, but that I regretted; next time, I’m going full throttle) but the most appropriate ride for us here food blog readers is The Land. Slightly better than what you’d find at an airport, the lettuce was decent enough, but the dressing tasted processed and straight-from-the-bottle and the chicken? It was like the pre-cooked chicken you buy in a little plastic bag at mainstream grocery stores. It really sucked. And it especially sucked because it was served in a building dedicated to agriculture, farming and the bounty of our good earth. That’s pretty sucky. I know many of you might say we chose poorly: that Epcot has its decent food, especially at the Italian and French pavilions. And I’d agree with you–I’ve eaten at both (Paul Bocuse, in fact, consulted on the French restaurant menu)–but, let’s be honest, you wouldn’t pay admission to Epcot just to eat at either one again. And that’s disappointing because why shouldn’t the countries at Epcot have great food? But here’s the thing: you can make them care. I’m not even saying that in an idealistic, gee-whiz let’s all eat granola kind of way; I’m saying it from a business perspective. Look at Las Vegas, for example: notice how Vegas promotes its star chefs as a primary reason to visit Sin City? Every time I open a Gourmet or Bon Appétit, there’s an ad for Vegas with pictures of Joël Robuchon and Guy Savoy and Bobby Flay and Mario Batali and so on and so on. Imagine if Epcot turned its countries over to star chefs to reinvent the restaurants: Rick Bayless does Mexico, Mario Batali does Italy, Bobby Flay does America. And what if they gave The Land pavilion to Dan Barber and Alice Waters? Couldn’t Disney then advertise Epcot like Vegas? Wouldn’t that be good for business as well as good for the customers who will finally get better-than-decent food to eat? Wouldn’t that allow Epcot to actually make itself relevant, instead of fading into obscurity as that weird theme park with a 1980s view of the future? And wouldn’t America be better for it? Epcot, more than most American institutions, has the capacity to really change the way Americans think about food. It’s a tourist destination that bills itself as a scientific experiment, its acronym unfolds to be: Experimental Prototype City of Tomorrow. If it truly wants to be that, it’s time it stopped feeding us the foods of yesteryear and started feeding us the foods of now. The Magic Kingdom can get away with corn dogs and pulled pork sandwiches, but Epcot? You can do better. Your nerdy fan believes in you and wants you to be the best you can be. Ok, Epcot? Get some good food now.